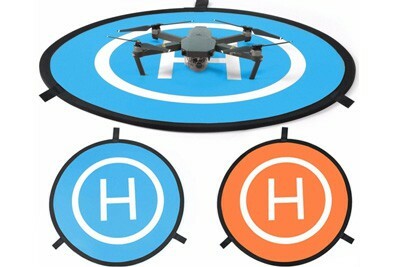 3 Best Drone Landing Pads [avail. on Amazon] No More Dusty Landings! What’s the purpose of drone landing pads? Most people think that drone landing pads have one simple purpose – to serve as a proper guide for landing a drone. Besides that, there are also a few more viable ones that are mostly arranged by higher end landing pads. The most important one (in addition to serving as a landing guide) is to keep dust and other debris from raising up in the middle of drone landing. This can prevent all sorts off issues such as the gathering of dust and sand particles in the bottom of your drone. So, with that being said, I’d like to take you through the process of purchasing a proper landing pad. First off, I’ll show you the basic steps you need to take before purchasing a landing pad, after which I’ll guide you through some of the best options available on the market. So, without further adue, let’s start! 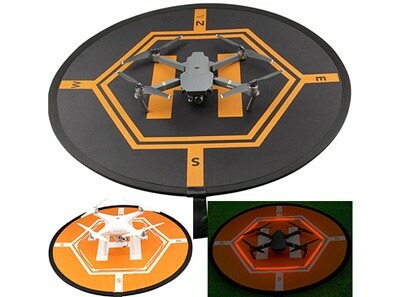 How to choose the best drone landing pad? Now that we’re here, let’s take a closer look at the basic aspects of landing pads so you know what to look for when buying one. Size is not that important but is still a characteristic that you should not take for granted. Even more so if you have a big drone, for example, DJI Inspire 1. The standard landing pads have 3-5 feet diameters. While 3 feet is a bit too small for DJI Phantoms (it can still fit but it will require good piloting skills), 4 and 5 are both excellent for virtually all drones. Since landing pad for Mavic Pro is extremely popular, there are many landing pads that are sized specially for that specific drone. When it comes to materials, what you should ideally look for is a waterproof construction that’s easy to fold. Besides that, you should also look for weighted edges that won’t allow wind to mess up their position. Make sure you pick up a drone landing pad that has a very bright and easily seeable color scheme. Ideally, you should look for extremely strong versions of orange, yellow, red and (fluorescent) green. I know for a fact that those colors are visible from big heights. There are certain (read high end) quadcopter landing pads that have an automatic spring-into-shape mechanism. Additionally, there are also models that have specialized imprints for easier folding. 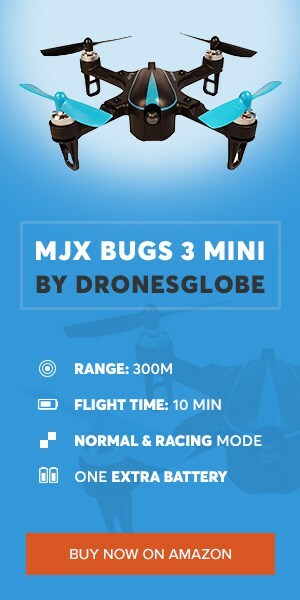 While it might not seem like a big deal, if you’re a frequent drone user you’ll be more than thankful for this. We are starting off with this waterproof landing pad made by RCstyle. Even though its name suggests it’s only meant for DJI Mavic Pro, in reality it will serve virtually all drones out there. Even large drones such a DJI Inspire or Yuneec Typhoon H can land onto it without any problems. Still, this seems to be the most popular landing pad for Mavic Pro. Since it sports lightly padded edges, collapsing this thing back into its default state might be tricky, especially to new users. What you need to do is basically twist and fold the edges at the same time which will allow it to spring back into small size, ready to be placed into its container. Luckily, there are few tutorial videos available on Youtube if you still have troubles with this little fella. Also, there’s official step by step instructions image on their amazon listing, click the link below to see it. If you are looking for the cheapest option available, you cannot go wrong with PGYTech’s best drone landing pad. This monstrous, 30-inch landing pad incorporates a fast-folding mechanism that makes it go from 30-inch to just 12-inch diameter in a matter of seconds. Pretty much all modern day drones can land onto it, including large drones such a DJI Inspire 2 or Walkera Voyager 2. What’s even better is the fact that this is a double-sided landing pad, having both orange and blue faces. Additionally, it also has reflective sticker for night flying as well as a carrying pouch for easy storage. All in all, if you’re looking for a basic landing pad, they don’t come much better than this one. In the end, I would like to show you what a premium (read pricey) drone landing pads looks like. This 5-feet diameter monstrosity from Hoodman is the best example of what a high-end landing pad needs to deliver. For starters, it has all the safety features you could wish for, including 8 pounds weighted perimeter that keeps dust and sand particles off of your landing area, keeping your drone as clean as possible. Moreover, it comes in an extremely strong and bright orange color which is clearly visible even during the darkest of nights. Last but not least, it’s important to mention it easily collapses and unfolds with a spring-into-shape mechanism. Collapsing transforms it into a small (20-inch) bulk which easily fits into the provided case. As you can see, quadcopter landing pads are much more versatile than most of you probably thought. It’s a contraption that many of you take for granted and probably don’t end up buying. But, in addition to being a guide, I’m sure most of you did not know that, in a way, these little fellas are able to protect your drone as well, keeping them safe from all unwanted debris. In the end, if you’re interested in something like that, you cannot go wrong with any of the 3 featured above.